EN: 2017. 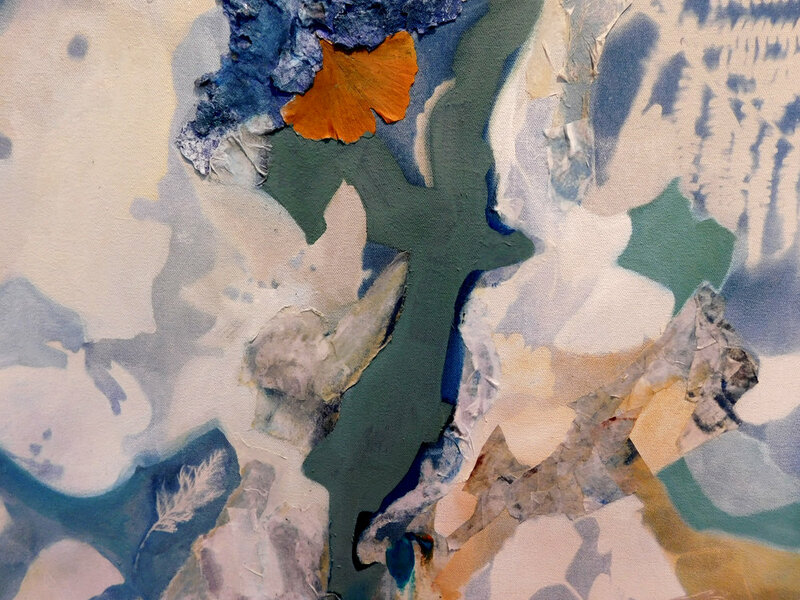 Cyanotype of collected leaves from the Parc Montsouris, Paris, monotype, hand-made recycled paper, Japanese washi paper, preserved leaves, bark, iwa enogu (Japanese glass pigments), French and Italian mineral pigments and linseed oil on canvas. Composition based on an aerial photograph taken by the artist of glaciers near Nova Scotia while flying from Paris to Canada. 3.74’ x 5.31’ (114cm x 162cm). FR : 2017. Cyanotype (à motif de feuilles collectionnés à Paris), papier recyclé fabriqué à la main, écorces, feuilles de ginko, fougère, etc. préservées, monotypes, papier washi japonais, pigments japonais iwa enogu (à base de verre écrasé), pigments naturels provenant de la terre française et italienne, huile de lin. 114cm x 162cm. Shiver and Float is the first cyanotype-painting I produced, inspired by the work of the botanist and first female photographer Anna Atkins, who mastered the cyanotype tachnique, working with its inventor John Herschel (1842). Here, the piece is presented along with the leaves that generated it as an installation, during the exhibition How to Capture Flow (2019). 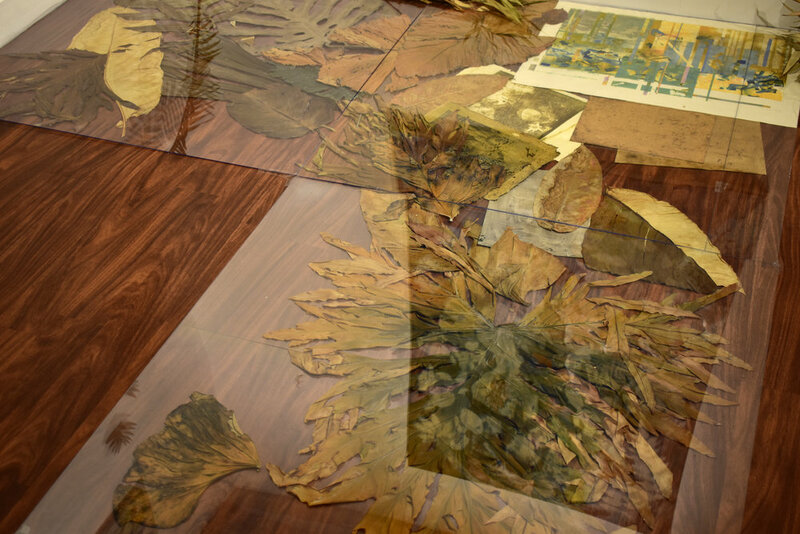 Below the plexiglass sheets are preserved tropical aracae leaves, anthotypes (photographic prints made only with crushed rose petals as a photographic emulsion and sunlight), monotype prints and photoetchings of waterlillies and platycerium leaves. Large standing leaf leaning on the wall chlorophyll print (imprint directly onto the leaf’s surface simply with a negative and sunlight).